Subaru announced details on the 2014 WRX and WRX STI but it won’t be the new-generation we were expecting. We’ll have to wait until the 2015 model year to see the new design. We’ve seen the next-gen performance car testing in Germany and in California, but the 2014 models continue with the same drivetrain. The 2014 WRX ($25,995) continues with a 2.5-liter turbocharged/intercooled four-cylinder Boxer engine that pumps out 265-horsepower and 244 lb.-ft. of torque and is mated with a five-speed manual transmission and Subaru’s Symmetrical All-Wheel Drive. The 2014 WRX STI continues to feature a 305-horsepower turbocharged/intercooled Boxer engine, six-speed manual transmission, performance suspension and the exclusive Multi-Mode Driver Controlled Center Differential (DCCD) version of Symmetrical All-Wheel Drive. The WRX STI remains the performance model that is sought after and still features Brembo performance brakes, Subaru Intelligent Drive (SI-DRIVE) and Multi-Mode Vehicle Dynamics Control (VDC) system, the latter featuring a track performance-optimized mode. We can look for more performance in the new-generation WRX STI. 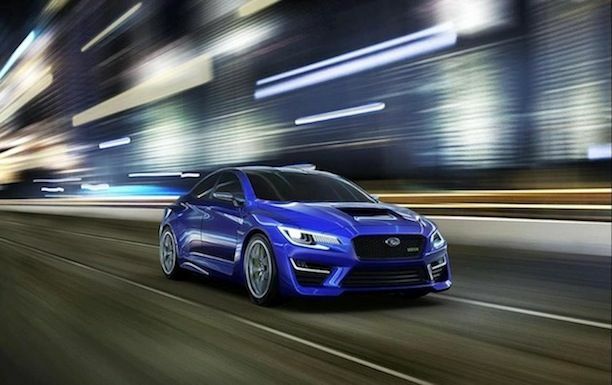 The new WRX will move the brand forward in styling that will incorporate both current Subaru family features and new designs not seen before.The new 2015 WRX should be lighter and more agile than the 2014 models. Subaru will likely make use of carbon fiber in the new roof to reduce overall vehicle weight. Performance fans can count on Subaru to bring the next-generation WRX and WRX STI with even more power and performance than before. Look for a new turbocharged intercooled engine with more power, a lighter more agile WRX STI with carbon fiber body panels, and improved handling in the corners and on the track from a tuned chassis. While we were disappointed that the 2014 Subaru WRX and WRX STI weren’t the next-gen models, we'll look for a better performance version when it comes out in 2015.